Abu Dhabi launched operations at the $7.1 billion Khalifa Port on Saturday, seeking to diversify its oil-based economy with a project that could intensify competition for the region's shipping traffic with neighbouring emirate Dubai. The port facility and the industrial area have so far cost $7.1 billion to build, ADPC chief executive Tony Douglas told reporters. He said government support meant the firm would not need to raise money in public markets. Khalifa Port's container terminal currently has an annual capacity of 2.5 million twenty-foot equivalent units (TEU). This can be raised to 5 million TEU according to demand over the next few years. Abu Dhabi has said its long-term goal is to increase it to 15 million by 2030, depending on demand. Khalifa Port will gradually take over all container traffic from Abu Dhabi's existing Mina Zayed port, which has reached its capacity of 1 million TEUs. 'Over four to six months we hope to complete the migration of all traffic that goes into Mina Zayed to the new port,' said Douglas. Mina Zayed will continue handling some commercial cargo and concentrate on developing a cruise liner business. Abu Dhabi, capital of the United Arab Emirates, is investing billions of dollars in infrastructure, real estate and tourism to diversify its economy. In shipping, the obvious challenge to its growth comes from Dubai, whose much larger Jebel Ali port is only about 40 km (25 miles) north along the coast. 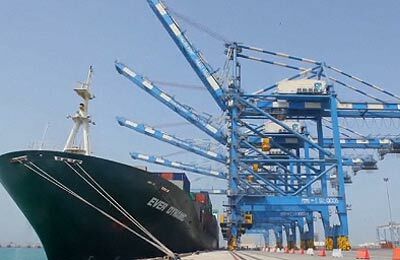 Last December DP World , the world's third-largest port operator and owner of Jebel Ali, said it would invest $850 million over three years to boost the port's capacity by 4 million TEU to 19 million. 'We are still growing to the extent of 7 to 9 percent this year. Also, what we foresee in terms of productivity being expanded in basic industries like aluminium and others will bring more capacity on line, and that will drive our growth,' said Martijn Van De Linde, chief executive of Abu Dhabi Terminals. Noting that the export-import ratio at Mina Zayed was about 80 to 20, he said Khalifa's growth would be driven by exports.